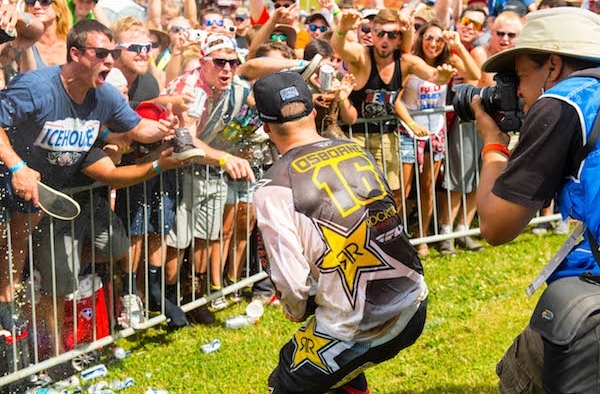 The historic RedBud National, held in Buchanan, Michigan, marked the halfway point of the 2016 AMA Pro Motocross Championship. Rockstar Energy Husqvarna Factory Racing’s Zach Osborne had a consistent ride and finished third overall in the 250 class, while teammates Christophe Pourcel and Martin Davalos finished seventh and 12th, respectively, in the 450 and 250 classes. Jason Anderson is still recovering from a broken collarbone and was forced to sit the race out. Zach Osborne has been putting in some strong motos lately, and didn’t let the tough RedBud track change his course on Saturday. After pulling mid-pack starts in both 250 motos he put in work and rocketed his Husqvarna FC 250 toward the front of the pack within a few short laps. His consistent lap times and battle mind set propelled him from 12th to a fifth-place finish in moto one. His second moto was just as inspiring as he started mid-pack and navigated to third by the ninth lap. He overtook second with two laps to go and didn’t look back. Continuing to battle, he got closer to the leader in the final lap with third place directly behind him. He put in a great ride and was only a few short bike lengths behind the win at the finish. The 5-2 finish gave him third overall on the day, and he is currently fifth overall in 250 rider point standings. Christophe Pourcel posted the fastest 450 qualifying time at RedBud. He was in the top 10 at the start of the first 450 moto and battled his way up to the sixth-place position by the end of the race. After a similar start in moto two, he stayed consistent and steady and finished seventh. The 6-7 finish put him at seventh overall, and he is currently seventh overall in 450 rider point standings. Martin Davalos dug deep this weekend despite an incident with a drunk driver earlier in the week that almost prevented him from racing. He pulled a mid-pack start in the first 250 moto and would eventually finish the race in 15th. He got an excellent top-three start in moto two, and immediately started battling for position. He came out of the opening lap in fifth, and finished seventh. The 15-7 gave him 12th overall, and he is currently 14th overall in 250 rider point standings.